Here in the South, the common joke is that many disasters, spectacular events, or both begin with the phrase, “Hey, ya’ll, watch this!” Usually after yelling that phrase, the person does something unbelievably stupid like jump off a barn roof onto a trampoline to see how far they’ll launch. (Something I confess to having done when I was about thirteen. Mercifully I ended up with only bruises but it could have been way worse.) The friends laugh and then the next person attempts something equally stupid until someone ends up in the hospital. Even if you aren’t imploring your friends to watch your stupidity, many of us do stupid things on a daily basis. We attempt to repair an electrical outlet, despite having no knowledge of electricity. We go out in a lightning storm, even though we know we shouldn’t. We drive without wearing seat belts. We text and drive. We attempt stunts for which we have not been trained. We handle fireworks. We drive through flooded roadways. We swim in deeper/rougher water than we can handle. We attempt to lift or move things we cannot manage, or for which we lack the proper equipment. In almost every case, though, we know better. We know we shouldn’t do these things. If we’re honest with ourselves, we know that certain things are dangerous, that we’re untrained for some tasks, or that we simply don’t have the resources to do something properly so we’re taking shortcuts. We get in a hurry and we want to finish or do something right now, rather than wait for help. We think we can do something cheaper than a professional, even though we’ve got no clue. We get a little drunk and our common sense goes out the window. We want to impress our friends with our bravado. Whatever the reason for taking the risk, in almost every case we know better but we do it anyway. Unfortunately, the cost of doing what you know you shouldn’t can be high. If you’re very lucky, as I was when I took a flyer off the barn roof, all you’ll end up with are some bruises and a sprained ego from your actions. Your friends will laugh at you and you’ll move on. It can be worse. You can end up severely injured. You can severely injure someone else, as is the case with texting and driving. You can break something to the point where it cannot be repaired or the repairs become prohibitively expensive. You can damage or destroy your own property, or that of someone else. You can die and leave your family without a breadwinner. When things go wrong, there are high financial costs. You can be sued. You may end up with medical bills you cannot cover. Your insurance may drop you. If you’re severely hurt, you may not be able to work. If you die without life insurance, your family may be in dire straits. In the best case, you’ll simply have to shell out the money to replace whatever object you broke. Your moment of ignoring your common sense can cost you thousands or even millions of dollars and ruin you financially. If you’re ever tempted to do something that you know you shouldn’t do, stop and think for a moment. Remember what your mother told you right before she punished you for your stupidity. “You know better,” is likely what she said before grounding you. You may not be able to stop kids from being reckless (recklessness is part and parcel of being a kid, after all), but as adults we do know better. Ignoring that little voice in the back of your head can be costly and dangerous. 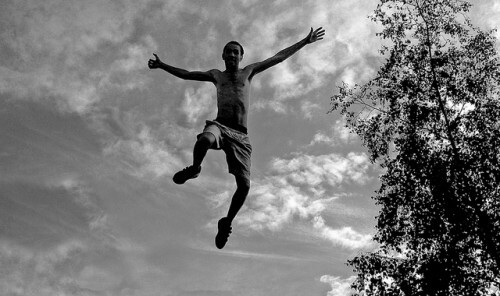 Great article – I’m still laughing about jumping off the barn onto a tramp! (only ’cause you ended up ok) Good Lord! I thought my kid was stupid when he jumped off the 2nd story loft onto the sofa below. It’s no wonder parents “age” with children.